Chicago lost tight end Zach Miller to a gruesome dislocated left knee injury Sunday. 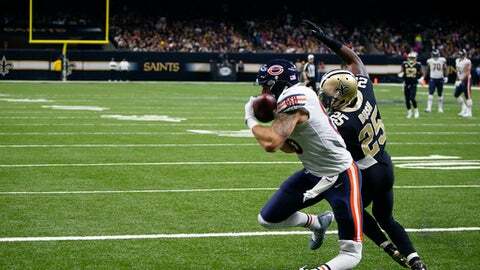 Miller was trying to make a 25-yard TD catch when his left leg got bent in an unnatural position as he landed in the end zone at New Orleans. The injury was replayed several times on the scoreboard and officials overturned the potential touchdown catch, saying the ball came loose when the 33-year-old tight end crashed to the turf. It appeared that Miller only let go of the ball on the ground because he was in pain. ”He’ll be in our thoughts and prayers on our flight home,” Bears coach John Fox said. Miller suffered the latest in a long line of tough injuries. After making a career-high 47 catches in 2016, he missed the final six games with a fractured foot. He did not play in any game from 2012 through 2014, primarily due to foot and shoulder issues. The Bears also lost two offensive linemen. Right guard Kyle Long left the game with a hand injury in the first quarter and center Cody Whitehair left later with an elbow injury. They weren’t the only linemen to go down Sunday. Vikings right tackle Mike Remmers left after sustaining a concussion on the second drive of the win over Cleveland. New England lost right tackle Marcus Cannon to an ankle injury in the first half of a win over the Chargers. Los Angeles linebacker Hayes Pullard and Patriots receiver Chris Hogan were both hurt on a collision in the fourth quarter of their game. Hogan had a shoulder injury. The 49ers got blown out by Philadelphia and suffered a bunch of injuries, too. It was so bad after left tackle Joe Staley (eye) and right tackle Garry Gilliam (knee) went down that tight end Garrett Celek was next in line to play tackle. Defensive linemen Solomon Thomas (knee) and DL C.J. Jones (knee), safety Jimmie Ward (forearm) and wide receiver Pierre Garcon (neck) also didn’t finish the game. Shanahan said Staley injured his orbital and needed stitches in his eye. The team said he was staying overnight at a hospital. Dallas lost wide receiver Cole Beasley to a concussion in its win over Washington. The Redskins, who came into the game without three starting offensive linemen, a starting cornerback and a starting linebacker who just went on injured reserve. By game’s end, a fourth starting offensive lineman (left guard Shawn Lauvao, stinger) was gone, too, as was the backup to the backup left tackle (T.J. Clemmings, left ankle).